Imagine a tiered tower of artisan cheeses, hand-selected to create a perfectly balanced cheeseboard and ordered to arrive in peak condition for your wedding day. What a fabulous centrepiece with a difference! If you love cheese more than fruit cake yet don’t want to dispense completely with tradition, this is a wonderful way to bring your own personal touch to your wedding day. 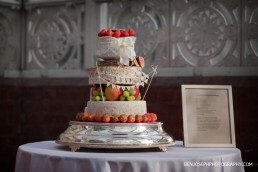 As part of our service we will create and decorate a cheese celebration cake to stunning effect, ensuring the Bride & Groom still get that moment when they ‘cut the cake’ before we whisk it away and turning it into a delicious cheese board. Our cakes are made up of cheeses that have been singled out for their outstanding qualities, so that, when the tiers are put together, they create the perfect harmony of appearance, texture and flavour. Guaranteed to make a real splash at the reception, and so much nicer than fruit cake when served with wine at your evening party. it is the ideal evening food to feed your hungry guests as it is protein-rich, and, when partnered with bread and crackers, some good chutney or pickle and fruit, will mop up the wine and the beer, and keep energy levels up so you can dance all night!